SARASOTA, Florida — On Wednesday, Oct. 13, scientists with Mote Marine Laboratory released corals of four species at two sites in the Florida Keys National Marine Sanctuary. 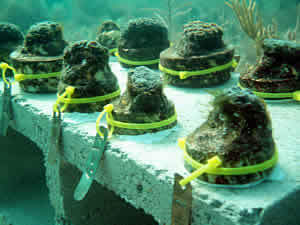 The release, permitted by Sanctuary officials and Florida Fish and Wildlife Conservation Commission, is designed to test the feasibility of using corals grown in land-based raceways and recirculating tank systems to restock damaged or depleted reef sites. One of the release sites chosen was a site Mote is using as a coral nursery for the threatened stagorn coral. The second site was chosen because it was especially hard hit by the record cold temperatures that caused a rare coldwater bleaching event in January of this year. 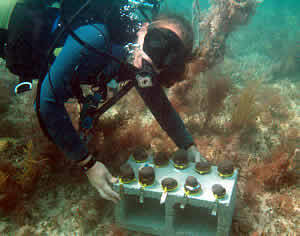 The corals will be checked and cleaned every two weeks and monitored for growth quarterly. A second release is planned for the spring. The release and study is supported by the Protect Our Reefs Program, in which funds generated by sales of the Protect Our Reefs specialty license plate are used for coral reef research, education and conservation programs. Other supporters include the Ocean Reef Foundation and the Rod & Gun Club. Posted on March 19, 2011, in Uncategorized. Bookmark the permalink. Leave a comment.